The Mercury Surface Element (MSE), a simple short-lived probe, will study in-situ the physical properties of the surface. 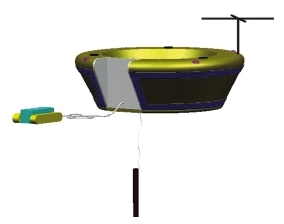 It will be deployed from the Magnetospheric Orbiter into an impact orbit to a high latitude landing site where the environmental conditions are less severe. MSE can carry up to 7 kg of scientific hardware and additional, or alternative, instruments can be included in the model payload. Instruments visualised for MSE comprise a descent camera, a panorama camera, a seismometer, a magnetometer, an alpha-X-ray detector for chemical elements, and a package to assess the temperature, heat capacity, density and hardness of Mercury's 'soil'. A soil-penetrating device (MDD) and a micro-rover (MMR) are required for the deployment of some instruments. The MDD (mole) is derived from the Russian Mars programme and reaches depths of several metres in a regolith. A rover attached to a tether can deploy instruments at selected sites several metres away from the lander.